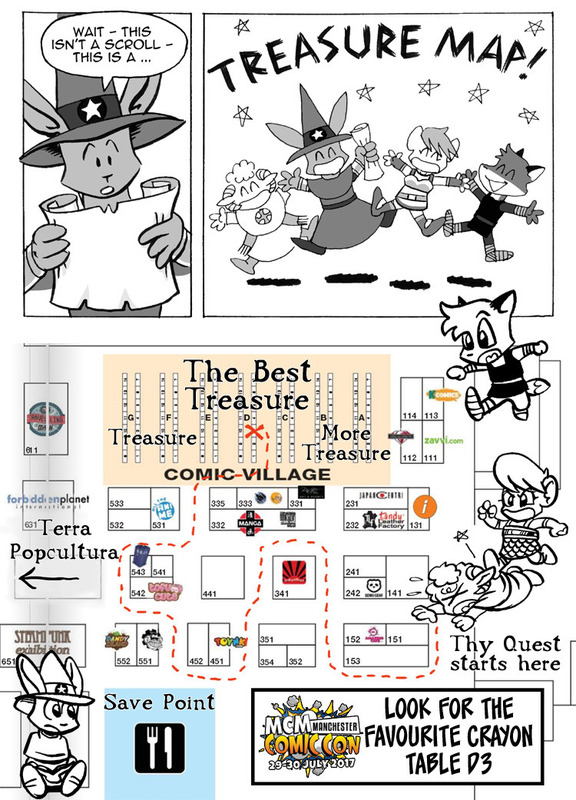 I’ll be at MCM Manchester Comic Con this weekend, where The Derivative Sub-Manga Furry Treasure Hunters! Complete Collection will be making its official debut! Every copy comes with a unique sketch and I’ll be available for custom requests too. Look for the Favourite Crayon Table - D3 in the Comic Village where you can find Fantasy Humour comics, postcards and sketches. The Comic Village is near to the entrance this year, so you don’t have far to go to find lots of Epic Loot! No matter what your Character Class, there’s bound to be some gear to fit your build! Don’t be fooled by this map; there is a whole other half of the hall to explore, as well as the side rooms for signings and panels. So stock up on supplies and max out your Inventory! Also, sketchcards, comics and other prints. Now open for commissions on a trial basis. See the Price guide for details. I shall be exhibiting at MCM Expo Manchester in a couple of weeks, sharing a table with FavouriteCrayon, where we will have a selection of comics and mini art-prints for sale. We'll also be drawing sketches and sketchcards on the day (some of those sketchcards are still available for sale, check the gallery for details).